Our Winterless Winter: Drought conditions across the United States as of January 2, 2018. Moderate drought (peach) expanded in size across Arizona according to the first United States drought monitor of 2018. 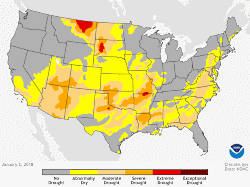 Overall, much of the Four Corners region of the southwestern United States is in some form of drought. Climate.gov map, based on data from the National Drought Monitor project. I’ve been in this lovely valley over 30 years and have never experienced such a balmy January, and now February. The thaw began January first and never ended. As an avid cross country skier, I fear my days of low elevation skiing have ended over a month early. So what do the computer models tell us about these phenomena as they predict our future in a warming climate? Our jet stream is acting might wimpy and limpey these days, which was what the climatologists saw coming in their modeling. I will attempt a brief explanation. The jet streams are high-altitude, racing rivers of air that can influence the path of storms as they track over North America from the Pacific Ocean. 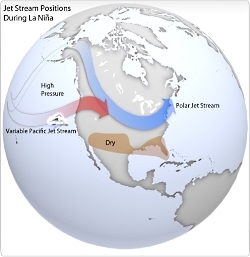 The jet streams meander and shift from day to day, but during La Niña events, they tend to follow paths that bring cold air and storms into the Upper Missouri River Basin. Map based on original graphics from NOAA’s Climate Prediction Center. The jet stream is highly impacted by the temperature differences between the poles and the mid latitudes where we reside. The greater this difference, the more robust the jet stream. The poles have been warming at a crazy rapid pace- several times faster than the lower latitudes. This has reduced the temperature differences which has two profound effects on the jet stream. First, with less energy to move it along, it stalls out so to speak and its patterns linger longer over our continent. Thus the prolonged extreme warm temps in the west, and prolonged cold in the east. A month ago my son living in Atlanta, GA called to say he was walking his dog in a foot of snow, a new experience for that southern boy! Jet streams also “follow the sun” in that as the sun’s elevation increases each day in the spring, the average latitude of the jet stream shifts poleward. (By Summer in the Northern Hemisphere, it is typically found near the U.S. Canadian border.) As Autumn approaches and the sun’s elevation decreases, the jet stream’s average latitude moves toward the equator. The second effect is the deep trough that allows the cold to reach well into those once toasty southern states. These sags can be shown with a jump rope. As you slow the energy, or rate of whip moving the rope, it begins to sag, creating a deeper, slower moving trough that even I can leap over! So our western part of the jump rope is stuck in an inverted trough (the upward swing of the rope), creating a high pressure system that has dominated our state and much of the west with very warm temps and very little precip. This does not bode well for our ski industry nor our water supply, which is locked in our scant snow pack. Many students from around the state have been working on a resolution with their state legislators which addresses this climate weirding. Bill HCR7 now resides in the House Natural Resources Committee, where it will probably be heard before you hear this. It may even have been on the House floor by then, and on to the Senate. The students are filled with hope that our state leaders will hear their testimonies in behalf of a future we all wish them to have. This is Jack Greene and I’m Wild about Utah!! It might be worth checking one’s mental state if they were to spend many hours in frigid temperatures hoping to find a bird. There are many of those crazies in our valley here in northern Utah. Citizen Scientists they call us. After all, we do follow strict protocol that defines boundaries, time and what is legitimately called a bird siting or sounding. Yes, there are errors in counts when a flock of European starlings darken the sky, or when trying to identify a distant raptor, that is scarcely more than a black dot in the heavens. Called the Christmas Bird Count, this event is the longest citizen science program in the world, where data has been collected since 1899. Here in Cache Valley it began in 1955. It occurs throughout the state and world with many countries participating. Visit your local Audubon chapters if you care to be involved. Wasatch, Salt Lake and St George all have chapters. Bear Lake, Vernal and Provo also do counts. And I am sure there are others in your area if you inquire. Along with the fun it brings, the count has special significance for our changing climates’ impact on birds, which is disrupting populations and their spacial distribution are changing at an accelerating rate. The data collected by observers over the past 118 years has allowed researchers to study the long-term health and status of bird populations across North America and Central and South America. When combined with other surveys such as the Breeding Bird Survey, it provides a picture of how the continent’s bird populations have changed in time and space. This long term perspective is vital for conservationists. It informs strategies to better protect birds and their habitat, and helps identify environmental issues with implications for people as well. Audubon’s 2014 Climate Change Report is a comprehensive study that predicts how climate change could affect the range of 588 North American birds. Of the bird species studied, more than half are likely to be in trouble. The models indicate that 314 species will lose more than half of their current range by 2080. Audubon’s Common Birds in Decline Report revealed that some of America’s most beloved and familiar birds have taken a nosedive over the past forty years. 142 species of concern are found in our state, including our state bird, the California gull and our national bald eagle. If you aren’t up to braving the elements, Project FeederWatch and Great Backyard Bird Count are other options you may find by googling. I’m hoping for good visibility and temperatures above zero as I prepare my optical instruments and hot chocolate. And please keep those bird feeders full as we enter the coldest month of the year! This is Jack Greene writing and reading for Wild About Utah. 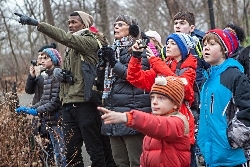 Audubon’s 118th Christmas Bird Count will be conducted this coming season, with all counts held between the dates of Thursday, December 14, 2017 through Friday, January 5, 2018. A small herd of deer bounded away over the manicured grounds of the Logan Cemetery, tumbled through its faux wrought-iron gateway, and hurdled across empty campus streets. I watched the deer disappear into alleyways between ocher-bricked University buildings, contemplating their explosion of wild life as my city woke to a quiet dawn. I’ve spent the majority of my life in cities. They have a human element to them I have not yet been able to forgo, but one I sometimes find myself running away from, toward the wooded hinterlands to hide. This experience, though, with the deer in the cemetery, startled back into my memory a truth inherent to our humanity. Our domestic metropolises are just another type of ecosystem for wild beings to populate. After all, we are wild beings ourselves. An ecotone exists where differing ecological systems meet; and along their shared border, a great wealth of biodiversity abounds- the edge effect ecologists call it. I bore witness to a variation of this phenomenon along the Northern Wasatch urban ecotone on a chilly October morning as a half-dozen deer escaped my advance. 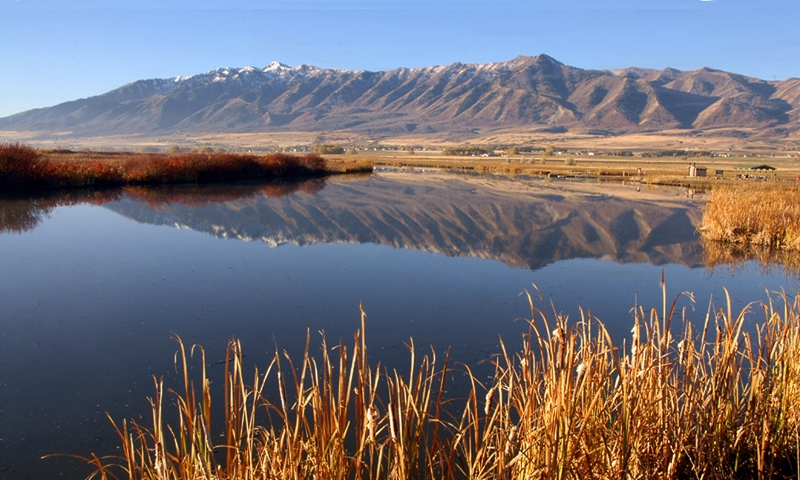 The urban ecotone wears a wardrobe of many styles, the most obvious being the type I’ve described wherein a conspicuously wild ecosystem-my home range of Bear River Mountains in this case- meets a decidedly civilized humanscape- the small city of Logan, UT. We call Logan the “city on the edge” for good reason. It’s the last great bastion of the Wasatch Front’s human imprint before wilderness takes over. From here, our Bear Rivers bear northward into an unobstructed wall of mountains all the way to the Greater Yellowstone Ecosystem. These mountains are, in fact, one of the last intact ecological corridors connecting the northern and southern Rocky Mountains, and Logan sits on the edge of it all, reaping all the wild benefits thereon. The subtler iterations of this sort of ecological spectacle may be smaller but are no less exciting. Ripping out a conquering crowd of last season’s mint crop in my garden this spring produced a surprised garter snake from an abyss below pungent leaves. The thin serpent slithered quickly away only to find himself upon a barren concrete expanse of patio. 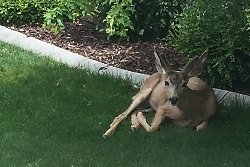 It paused for a moment to assess the situation, looked back at me and its former dwelling, then skipped on its belly across a freshly mown lawn and into the bushes adjacent to the creek that runs beside my home. More weeding produced several wolf spiders, a praying mantis, and a plethora of earthworms. I look forward to next year’s garden cleanup now. Then there are the green spaces: parks and natural areas that make a city worth living in beyond what we humans may more or less bring to it. Indeed, the scientific evidence is clear; those cities, towns, and villages whose urban ecotones are active and robust produce not only a slew of diverse wild species but a slew of wildly content people as well. It seems happy people go hand in hand with happy critters and their accompaniments. A 17-year study conducted by the University of Exeter Medical School in the UK concluded that, quote, “Findings show that urban green space can deliver significant benefits for mental wellbeing.” In an interview with the UK’s renowned Guardian Newspaper, another researcher is quoted: “We’ve only really had mass urbanisation for the last 200 years, say, out of our hunter-gather experience of 100,000 years.” End quote. Perhaps we have not grown as far from the natural world as we sometimes fear. Even in our cities, these brightly lit harbingers of our species’ growth and accomplishment, we are reduced to our elemental selves by a flash of fur through dawn’s fog. In those moments, we are just animals again. 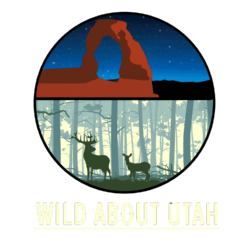 This is Josh Boling writing and reading for Wild About Utah. Most people appreciate viewing impressive forms of wildlife, such as Desert Bighorn Sheep in Zion, or Wolves and Grizzlies in Yellowstone, but they may not completely understand the quiet contributions that are being made to earth’s ecosystems every day by the small creatures around our own neighborhoods. These little ones help us in many unseen ways. It is estimated that one third of the food that humans eat has been provided by small pollinators such as Hummingbirds, Butterflies, and Bees. Having these creatures in our own yards can produce hours of entertainment, and education, as we observe them working feverishly among our flowers, shrubs and trees. Many citizens, and cities, are diligent in providing beautiful landscaped areas for these pollinators to gain nourishment as they work to increase the production of flowers and fruits. You can make your own hummingbird food by mixing one cup of sugar to four cups of water. Never put food coloring in hummingbird feeders. It can be harmful to them, and the red color of the feeder will automatically attract them. You should also use native, fertile plants in your landscaping design. And, unless you have a severe allergic reaction to bee stings, be assured that they are far more interested in gathering pollen than sacrificing their life to sting someone. Most people can work right alongside bees in their flower gardens. Wasps are another story. 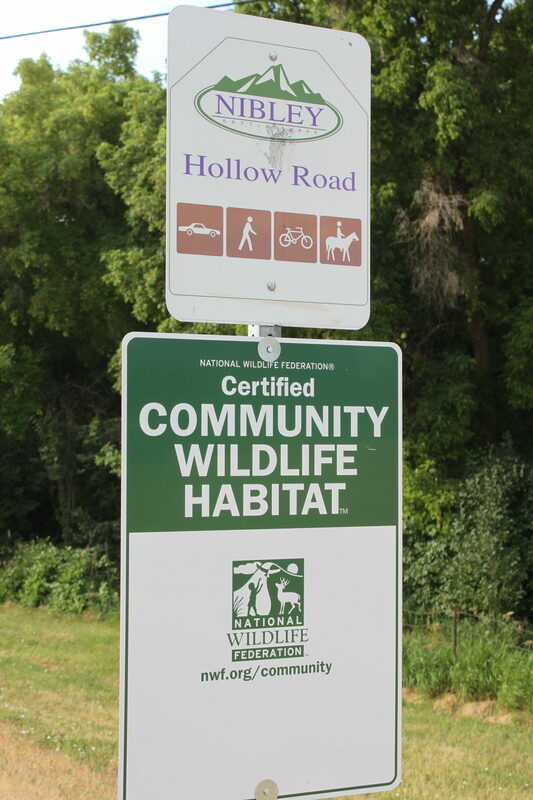 So, as you design, or alter, your property to be more usable by pollinators and songbirds you can be rewarded by the National Wildlife Federation through their Wildlife Habitat Certification program. If you provide food, water, shelter and a place to raise young…you are eligible to have your yard certified. Remember, we’re not talking about Mountain Lions and Elk, just pollinators and songbirds. If you have a birdfeeder, birdbath, and shrubs or trees you qualify. Nobody inspects your property. Go to their website at (www.nwf.org) and complete the simple application listed under Garden for Wildlife and, for a one-time fee of only $20, they will send you a personal certificate for your home, and a one year subscription to the National Wildlife magazine. They also have metal signs that you can post to show others that you care about wildlife. Once you see the value in this, encourage neighbors to do the same. 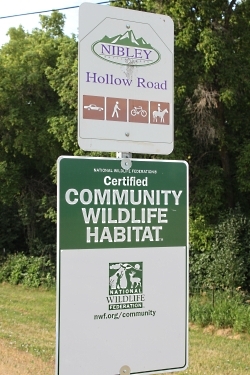 In fact, you can have portions of your entire community certified as wildlife habitat as did Nibley City in Cache County. They were the first city in Utah to do so by certifying 100 properties, and they are ready to help others around the State to join them in this rewarding effort. Next time you’re in the grocery store, or harvesting from your own garden, remember that a lot of that food would not exist without our diligent pollinators.